Panch Phoran (aslo called Panch Phoron) is an Indian whole Spice blend which is a mix of cumin seeds, nigella seeds, fennel seeds, mustard seeds, and fenugreek seeds. Panch Phoran literally translates to 5 spices. While most Indian spice blends, like garam masala, are made by dry roasting whole spices and then grinding; panch phoran is very simple. Just mix the 5 whole spices and store it in an air-tight bottle ready for action, when a recipe calls for them. Cumin Seeds: Known as zeera in Hindi, cumin is a common seasoning and flavor agent in many cuisines. It is used both as a whole and as a ground spice. Cumin helps improves digestion and also clearing phlegm and mucus. 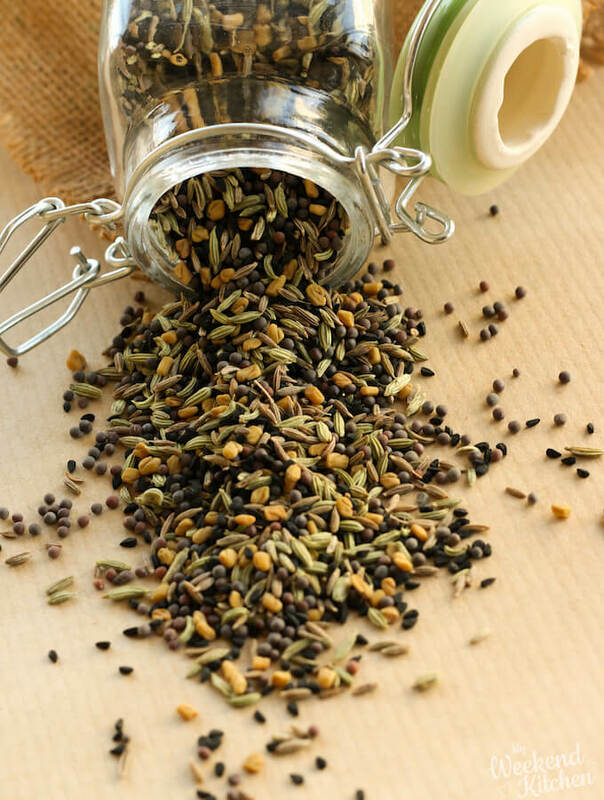 Fennel Seeds: Known as saunf in Hindi, fennel has an anise-like flavor and is a commonly used as a mouth freshener. It is used both as whole seed as well as a powdered spice in recipes. It is a digestive aid and also a good source of fiber. Fenugreek Seeds: Known as methi dana in Hindi, fenugreek seeds help control diabetes, cure constipation, and reduce menstrual pain. Fenugreek seeds are usually used as whole seeds in tempering. Another common way to consume fenugreek seeds is by sprouting them. Mustard Seeds: Known as rai in Hindi, mustard seeds help in controlling diabetes and cholesterol levels. They are also mostly used as whole spices in tempering. Nigella Seeds: Known as >em>kalongi in Hindi, nigella seeds boost memory and help cure diarrhea. They are used as whole seeds for tempering and also in making traditional Indian pickles. Panch Phoran is commonly used for tempering in the cuisines of Eastern India, Bangladesh, and Southern Nepal. When used for tempering, these spices add a rich aroma and infuse the oil or ghee with a depth of flavor that dry spices cannot add. To use, simply add them to the pan once the oil or ghee is hot. As the seeds sputter they infuse the oil with their aroma, which becomes the first layer of flavor for the curry. After the tempering, the base vegetables of the dish are added to the oil like in this Panch Phoran Baingan recipe. Bengali and other cuisines of the region often use mustard oil for cooking. When paired with mustard oil, panch phoran spice mix enhances the nuttiness of the oil. Traditionally in Indian cuisine, we use panch phoran spice for tempering as the first step of cooking a curry, but you can also use the tempered oil as a dressing for yogurt dips and salads. While it is difficult to pinpoint the taste to one word, the predominant taste of the tempered oil for me is more anise-like. This might be because of the 5 spices used in the blend, fennel seeds have the strongest taste. If you like to make your own spice mixes, please take a moment to rate the recipe below and/ or leave your thoughts. It will really encourage me to keep improving and trying newer things. 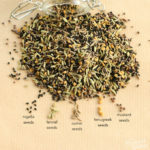 A traditional 5-spice blend from Eastern Indian cuisine; Panch Phoran is commonly used for tempering to add flavour to the oil as a base for Indian curries. You can also add the tempered oil as salad dressing or season dips. Mix all the whole spices together in a bowl and store in an air-tight jar. Use for tempering with oil or ghee for Indian curries or for flavouring your salad dressing and/or dips. Whole spices retain their flavor longer than ground spices but they do lose their strength with time. It is important to store them in air-tight jars and in a cool place away from direct heat from outside or from the cooktop/microwave/oven etc. Nutrition Fact is for 1 tbsp of Panch Phoran spice mix. While panch phoran essentially is a simple mix of 5 whole spices, it may be that you don’t have all the spices or the spice mix before realising that the recipe you embarked upon requires Panch Phoran! In that case, you can use whatever spices you have from the 5 Panch phoran spices. The real flavor comes from the combination of the spices, but in case you are stuck, missing a few of the spices won’t harm too much. Very nice & simple recipe. Can you accept my simple recipe as a guest post. I liked your style of posting recipe. Thank you so much. I am glad you liked the recipe and also the way they are presented here. I do not post any guest posts on the blog because I want to be sure that every recipe that is on the blog is tried and tested by myself before I share it. 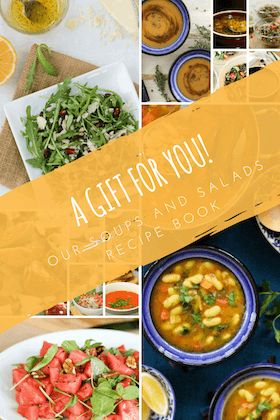 While I am sure your recipes are great, it is just a way for me to ensure authenticity and reliability to the readers of the blog.